If you work in a busy kitchen, you know how essential broth and stock are for a variety of dishes on a restaurant or catering menu. Many believe the two are interchangeable, but are broth and stock the same thing? Read on to explore their differences and learn when to use stock versus broth. Stock is made by simmering bones in water and is used as a thickening agent, while broth is made by simmering meat and is used to provide flavor. The main factors that separate stock from broth are the ingredients, seasonings, and cook time. Although many chefs cook with broth and stock similarly, they do lead to slightly different results and perform best when used appropriately. Are Stock and Broth Interchangeable? Stock and broth can be used in various of the same dishes, however, they may impact your end result differently. Stock will add thickness to your dish while broth will add more seasoning and liquid. You may water down and season a stock to achieve a broth-like consistency. To thicken a broth, you can add flour or cornstarch to achieve a stock-like consistency, but the additional seasoning will be present so be sure to counterbalance that by reducing the seasoning in your recipe. Stock is a culinary thickening agent that is commonly made from chicken or beef bones, however, pork or fish bones may be used as well. 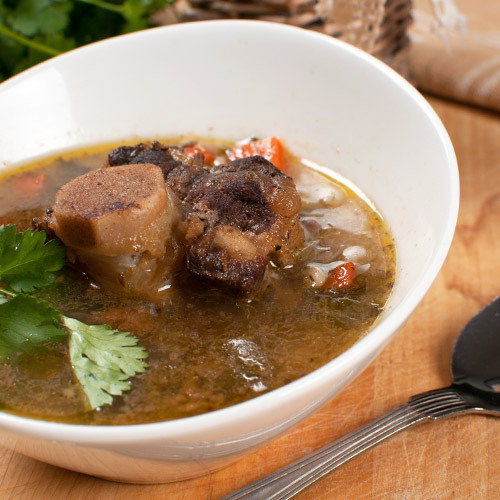 A prolonged simmering of the bones allows for the collagen and marrow to be released, which creates a thicker and slightly gelatinous texture while providing a fuller and richer mouth feel. Stocks are left unseasoned to allow the chef control over the flavors in their dishes. Stock is made with a combination of animal bones, mirepoix (onions, carrots, and celery), and aromatics like peppercorns, bay leaves, and parsley stems. This combination of ingredients is then brought to a simmer and allowed to cook for 4 to 8 hours depending on the desired consistency. The longer the cook time, the thicker the stock becomes. Stock is best used as a neutral base for a recipe in order to enhance the natural flavors and juices of meats while thickening the consistency of the meal. It is often added in a recipe to be used in the place of cream or butter and is not consumed on its own. Broth is a culinary enhancer that provides flavor in a liquid form, made by simmering meat in water. It is well seasoned and maintains a relatively thin and liquid consistency. It is significantly thinner and more flavorful than stock. 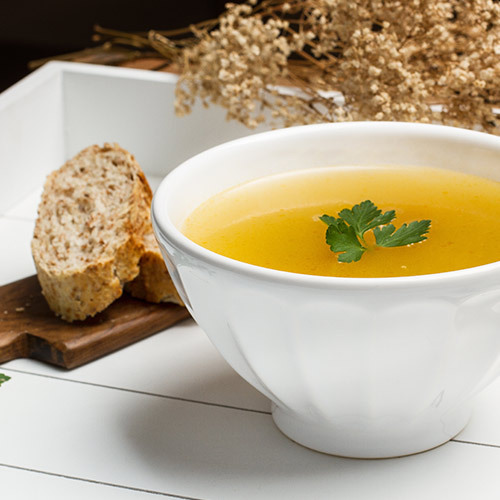 Being a meat-based liquid, broth is typically made from beef, chicken, or fish; however, it is not uncommon to find vegetable broth. To make broth, simmer meat, mirepoix, and aromatics in water for approximately 45 minutes to 2 hours. To avoid overcooking and drying out the meat, any meat pieces should be removed from the water after an hour or less. The meat can be added back in at the end of the broth’s cook time or used in another recipe. At the end of the cook time, the broth should be strained and well seasoned. Because of its thin consistency and flavor, broth can be used for a variety of culinary reasons. It can be sipped on its own and is often used as a remedy for illnesses such as the flu or common cold. Chefs will also use broth in the place of water to enhance the flavor of their dishes, such as using broth to boil pasta and steam vegetables. Bone broth is not quite a stock or a broth, but rather a combination of the two. Like a stock, it is made by simmering roasted bones and some meat in water. However, unlike stock, the cook time of bone broth is approximately 24 hours or more. The purpose of the extended cook time is to extract nutritious compounds and minerals such as amino acids, calcium, electrolytes, and glucosamine along with the collagen and marrow. Once cooked, it is strained and seasoned like a broth with the intention of being served on its own. 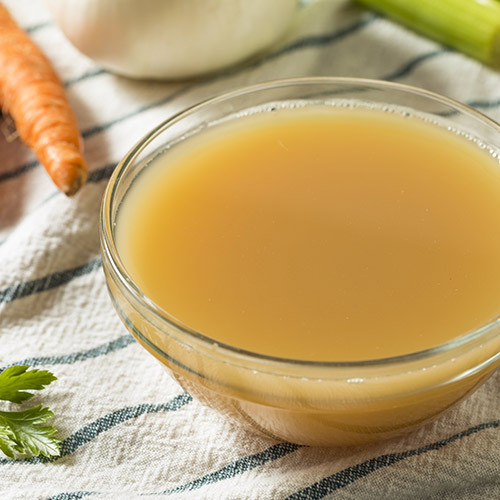 Bone broth is thought to have health benefits, such as providing the body with vitamins and minerals, supporting joint health, and reducing inflammation. It may be confusing to recall which enhancer you need when you are shopping in the supermarket. If you’re in doubt, choosing a low sodium option of either stock or broth can help you control the flavor of your dish and allow you to adjust the recipe to your liking.